Humayun's tomb (Maqbaera e Humayun) is the tomb of the Mughal Emperor Humayun in Delhi, India. The tomb was commissioned by Humayun's first wife and chief consort, Empress Bega Begum (also known as Haji Begum) in 1569-70, and designed by Mirak Mirza Ghiyas and his son, Sayyid Muhammad. It was the first garden-tomb on the Indian subcontinent. The tomb was declared a UNESCO World Heritage Site in 1993. Hampi also referred to as the Group of Monuments at Hampi, is a UNESCO World Heritage Site located in east-central Karnataka, India. It became the center of the Hindu Vijayanagara Empire capital in the 14th century. Hampi was a prosperous, wealthy and grand city near the Tungabhadra River. 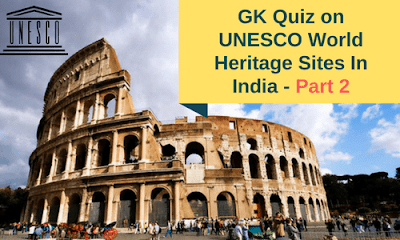 Which of the following is inscribed as UNESCO World Heritage Sites in India? Group of Monuments at Mahabalipuram- Tamil Nadu. Western Ghats- A total of thirty nine properties (including national parks, wildlife sanctuaries and reserve forests) were designated as world heritage sites – twenty in the state of Kerala, ten in Karnataka, five in Tamil Nadu and four in Maharashtra. Which of the following is the UNESCO World Heritage Site in India? Taj Mahal, one of the Seven Wonders of the World is a mausoleum – a funerary mosque. It was built by Emperor Shahjahan in memory of his third wife Begum Mumtaz Mahal who had died in 1631. It is a large edifice made in white marble in typical Mughal architecture. It was inscribed in the UNESCO World Heritage List in 1983. Qutub Minar and its Monuments, Delhi, located to the south of Delhi, is a complex with the Qutub Minar as the center piece, which is a red sandstone tower of 72.5 meters (238 ft.) height with a base of 14.32 meters (47.0 ft.) reducing to 2.75 meters (9.0 ft.) diameter at the top. History records its construction, initially by Qutubuddin Aibak in 1192, its completion by Iltumish (1211–36) and again by Alauddin Khalji (1296–1316). Khajuraho Group of Monuments attributed to the Chandela dynasty which, under sovereignty of Gurjar Pratihars reached its glory. The ensembles of monuments that have survived belong to the Hindu and Jain Religious practices with striking fusion of sculpture and architecture. Located in the Indian state of Madhya Pradesh, it was inscribed by UNESCO as a World Heritage Site, a cultural property on October 15, 1982. Ellora located in the Aurangabad district of Maharashtra, India, is one of the largest rock-cut monastery-temple cave complexes in the world, and a UNESCO World Heritage Site, featuring Buddhist, Hindu and Jain monuments, and artwork dating from the 600-1000 CE period. Which of the following are accorded as UNESCO World Heritage Sites in India? Which of the following UNESCO World Heritage Sites are in Bihar?